Day +89: Last week Kiira had a swallow study. It did not show any strictures in the throat or upper esophagus, which is great, but she is still choking on soft solids such as avocado. Our next step is to resume feeding therapy when we get home and hopefully she will pick up the proper eating technique quickly. Today’s clinic appointment was quick and uneventful. 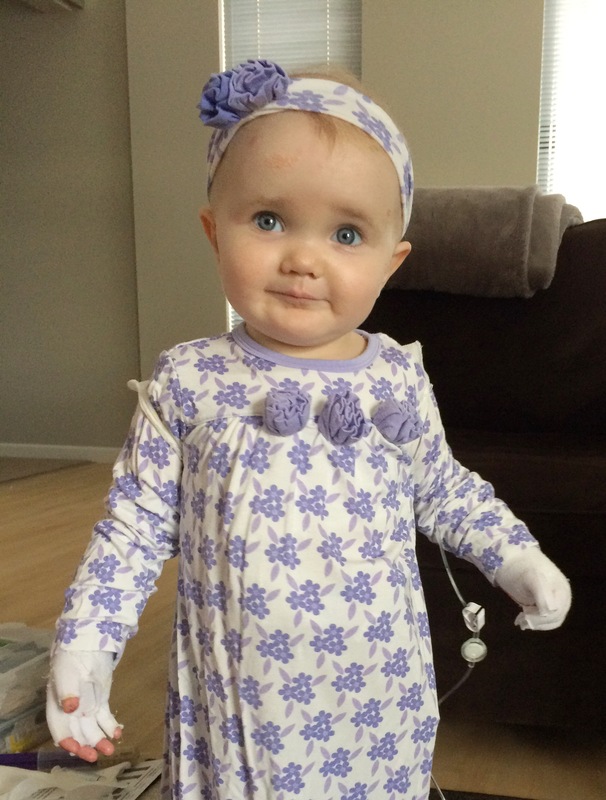 Kiira’s white blood cell count’s are back to normal and CMV (virus) is still detectable but below the treatable amount. We are staying off IV meds and can plan to go home in two weeks. On Wednesday Kiira will go into the OR for a skin biopsy to determine if she is producing any collagen VII yet. It is a routine procedure but prayers are still appreciated. My aunt left yesterday after a 10 day visit. It was so nice to have an extra set of hands to entertain Kiira. I even got a night out with a friend which was so nice. Thank you for your help! Jason will arrive in two weeks to drive home with us. It is hard to believe we are wrapping up everything here and we may have had to do the BMT twice, but it could not have gone any better both times and I’m so thankful for that! Bandages: Kiira is still using bandages donated 2 years ago by many of you (and still have plenty of most things). We cannot express our appreciation adequately in words. Our insurance still doesn’t cover them and they can cost thousands of dollars a month. 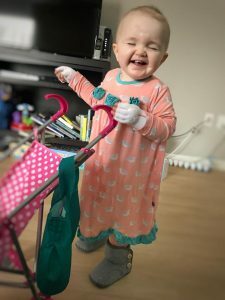 When Kiira was born 2 years ago, I was so stressed about providing her with what she needs to reduce wounds and infections, but God used a number of people who came to Kiira’s aid and subdued my worries for over 2 years! We learned how to reduce waste and reuse bandages when we can, but I felt like we witnessed a miracle of never-ending supplies. We have even sent some overseas to help others in need of bandages, because unfortunately not everyone has those resources. 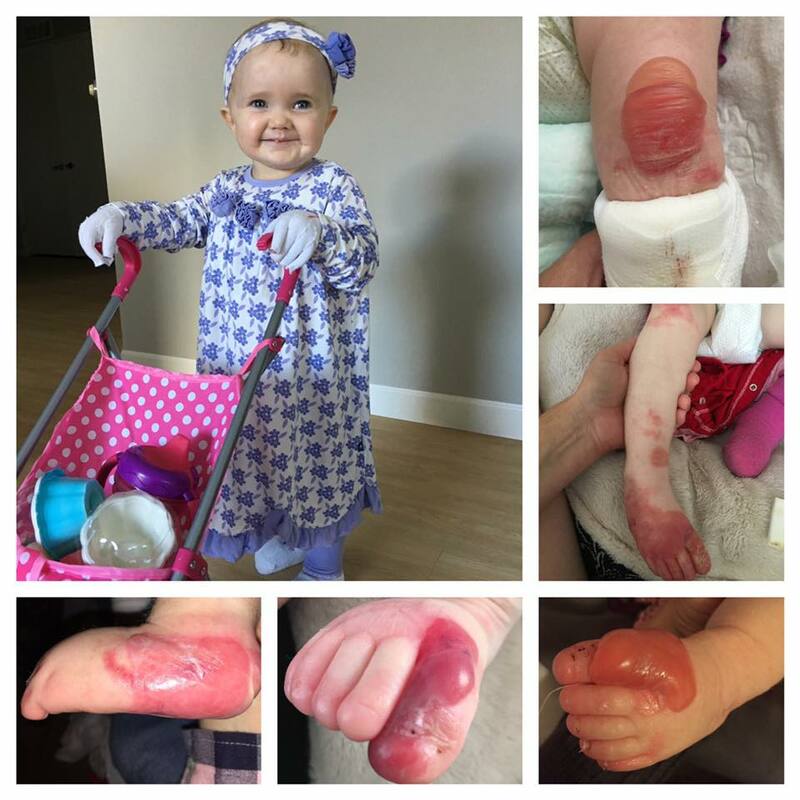 Without a cure, bandaging the skin is the only protection we can provide to those with EB. 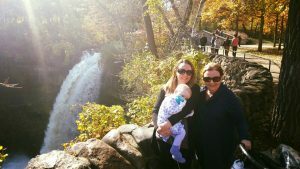 Several organizations and fundraisers rise up to help support those families, like debra.org and IrefuseEB.org, but many families still have to do fundraising on their own to cover supplies, copays, lost wages due to so much time off to care for a child with EB, special clothing, and so much more. Thank you for blessing us. It helped Kiira be as healthy as possible and relieved so much stress for our family. Thank you! Sometimes waiting for a cure takes too long. It requires too much money, time, trial and error (and patients to be a part of those trials but when there’s only one in a million, that doesn’t leave many to try it), and red tape. Plus, the only way to cure EB is genetic modification, which is very controversial and extremely difficult to do. So, in the meantime, there are organizations like debra.org who help patients with bandages, tips, and other resources to make life with EB easier. 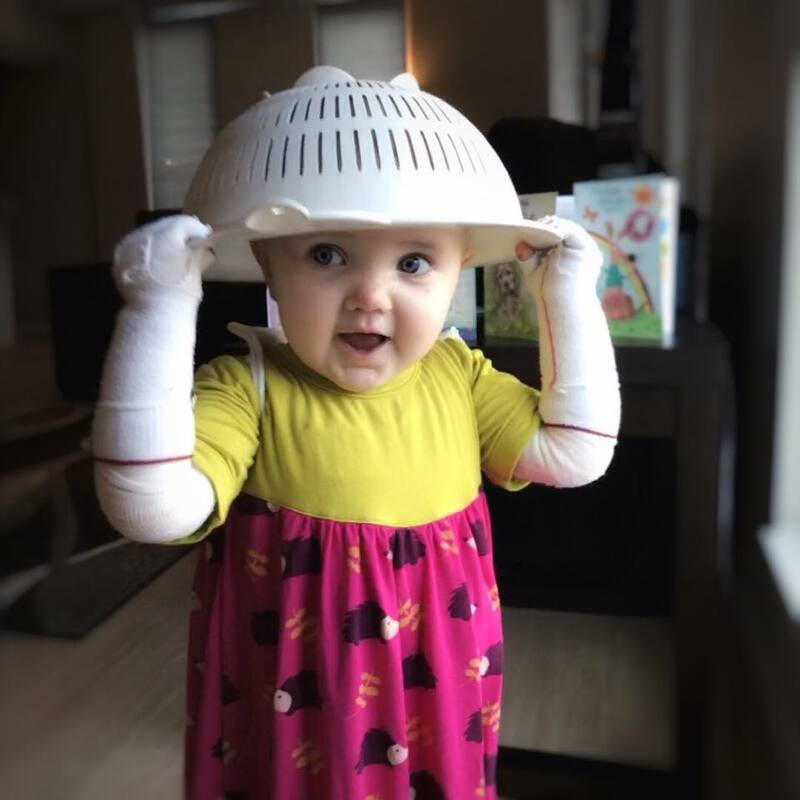 We are thankful to them and the EB community for keeping us up-to-date on bandaging techniques, creams, medications, clinical trials and other things we can do to help Kiira. However, it couldn’t be possible without funding, of course. Consider donating to debra.org to help those with EB. 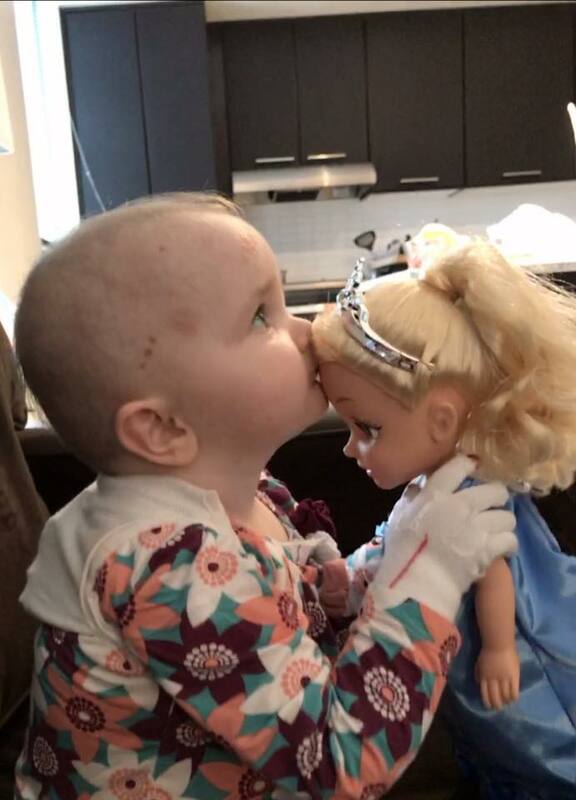 We may have done a bone marrow transplant to keep Kiira from blistering as much and help her heal faster, but EB is still very much a reality in our lives. Just a few months ago (pre-BMT), this is what her feet and knees endured. Though we see less of this after the BMT, yesterday she stepped on something, blistered the bottom of her foot and could not walk. I carried her wherever she wanted to go and it broke my heart watching her attempt to push her stroller when the pain was too much. EB is harsh, but Kiira pushes through with unimaginable strength and despite the pain in her foot, she made herself walk around today. EB affects about 1 in 20,000 people and Kiira’s subtype, RDEB, affects 1-2 in a million. Though research has made enormous strides despite being so rare, we have a long way to go to find a cure. 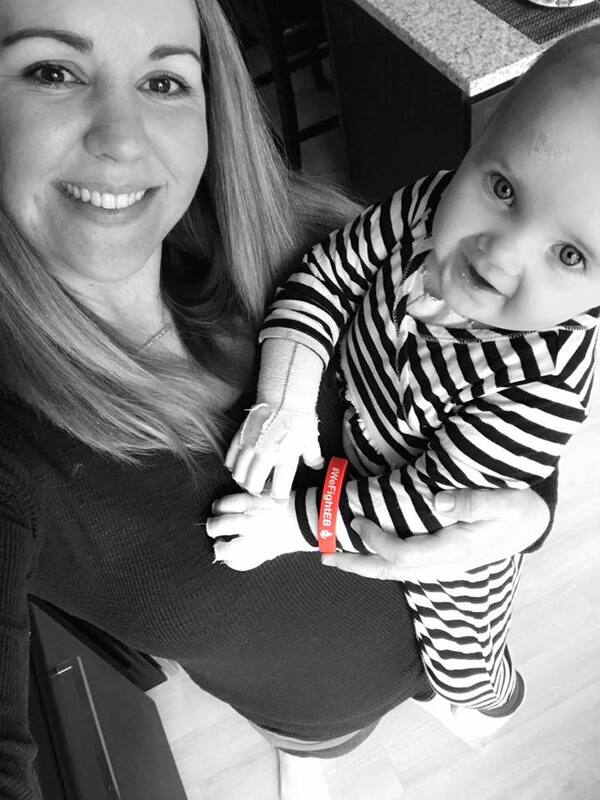 We support the work of Dr. Tolar and the team at the University of Minnesota who actively seek a cure for EB, and if you want to help find a cure for Kiira, 100% of proceeds to irefuseEB.org go toward that research. Day +82: Kiira’s clinic appointment went well today. 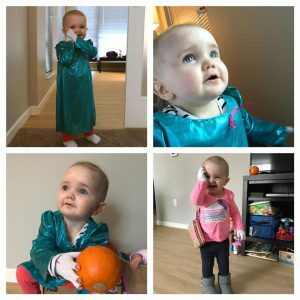 Her WBC count has gone up some and while we wait for her CMV (virus) results, we’re sticking to our plan to stay off the IV antiviral and restarting an oral one to keep her immune system up. I’m already making preparations to head home in about 3 weeks. We have several more things to get through, including a swallow study on Wednesday. Kiira has been choking on the tiniest bits of food. She isn’t drooling and I’m not seeing blood in her mouth, but I’m wondering if there’s some narrowing in her throat or upper esophagus that can’t be seen by an endoscope. We haven’t done one since she was 4 months old and I’m hoping her throat is clear, but we want to be sure before we head home. Unfortunately this is extremely common in EB due to blistering and narrowing of the digestive tract and I’m beyond thankful it hasn’t been an issue for us yet. Stopping the internal damage was an enormous reason for us to do a BMT so early for Kiira. Once the damage is done, its irreversible. 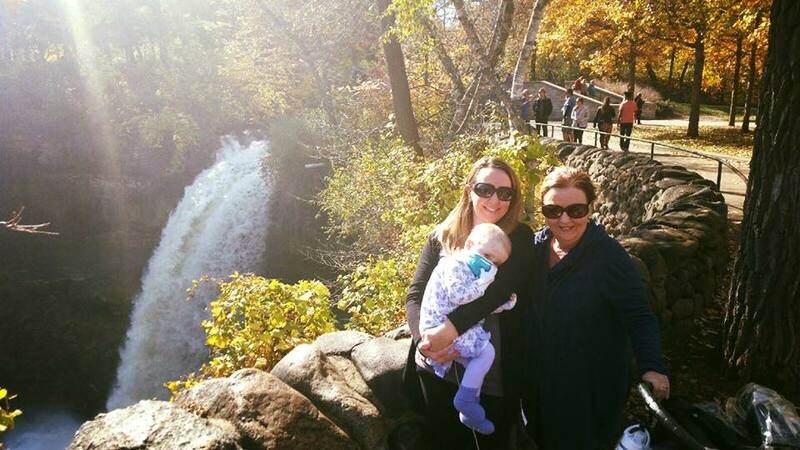 My aunt is here visiting so we enjoyed an outing to Minnehaha Falls. Kiira wanted to see the waterfall so much that she actually wore her mask for about 20 minutes. I was shocked! Thank goodness for the stroller rain cover, which gives us the freedom to go for walks without the fight or discomfort of a mask. We appreciate your continued prayers as we know they’re working. Thank you! Day +77: All went well today with Kiira’s infusion. We were in clinic for 4 hours and learned some new info during that time. We are going to continue to hold off on the IV meds used to treat CMV and the antibiotic because Kiira’s white blood cell count came up. Our provider did several tests on Kiira today to make sure she doesn’t have antibodies or malfunctioning bone marrow, and a few other things that would account for more serious reasons for Kiira’s white blood cell count drop. So far everything is coming back clear (some tests we won’t know for few more days), so it’s looking more like IV meds were the culprit. However, CMV also came back as detectable on Monday and that was before we even stopped the IV med. They’re going to draw a new level today to see where it’s at with her not having been on the meds for the past two days. If CMV levels go back up, they will have to do the other treatment in the hospital since this one is depressing her immune system. Also, if they cannot restart the antibiotic, they will have to do a monthly antibiotic in the clinic for a year, which we can do in California, but I have to take her in every month for that. If her counts stabilize, then they could possibly restart the oral antibiotic. Kiira did a great job of entertaining herself today, which made the day go by with ease. Please pray for increased WBC and decreased CMV so we can keep things on track. Thank you! Day +75: Today Kiira had a routine clinic appointment. Overall things are still fine, but her white blood cell counts and platelets went down fairly significantly. 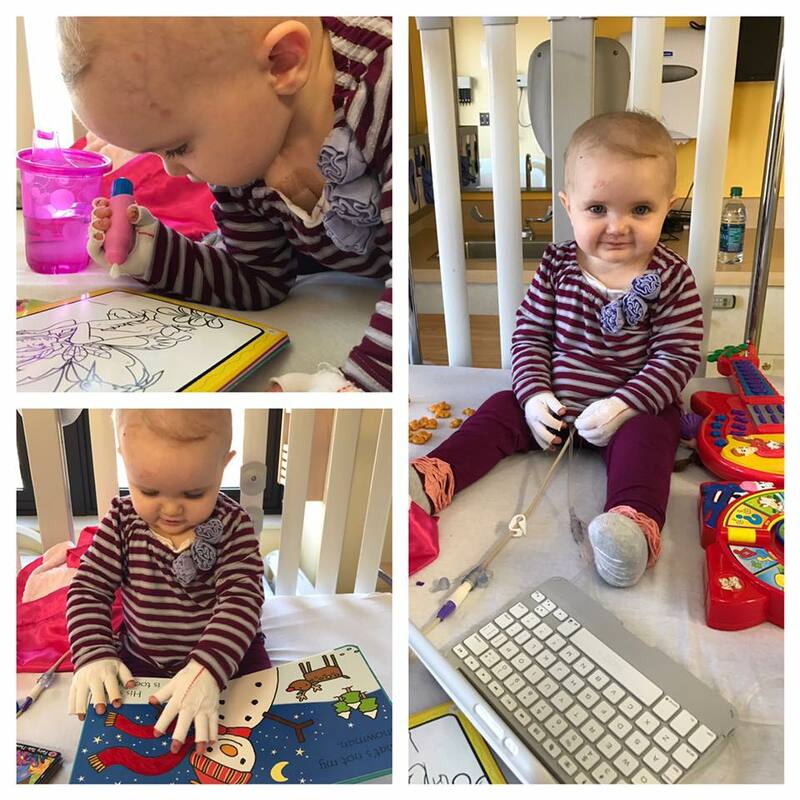 As a result, on Wednesday she will have IVIG and GCSF infusions to help boost her immune system. These have gone well in the past, so though it might be a long day, Kiira’s central line makes it easy to get these IV medications. Child Family Life, a great program at the hospital to provide support to the families, gave Kiira a birthday present today. It’s just another way she is shown the love at this hospital. We feel so blessed to be seen here and for them to proactively treat Kiira as needed, even with a boost of fun to celebrate her birthday! Day +72: We had a great week! Jason and the girls were here from Sunday to Wednesday morning. Though it was a quick trip, it was wonderful to have our family back together. We celebrated Kiira’s birthday a day early so they could be here too. Though it was nothing big, she loved that we sang to her and she got a little guitar (ukulele), because she loves music so much. I thought maybe she would be attached to me, but she jumped right back in with her sisters and everything was “daddy do it!” I’m glad she remembered them so well. Since they left, Kiira asks for them every morning and almost seems sad that they aren’t here. We had a check up on Monday and everything is still looking good. We have our final visits scheduled and if all goes well in the OR on November 16th, we will be driving back to Ca on November 17th and get home a couple days before Thanksgiving. We still have to keep her isolated for 6-12 months and we will return to Minnesota in late January for a week, but I couldn’t ask for things to have gone better, considering we had to do the BMT twice. I am so thankful that Kiira is under such amazing care here in Minnesota. The doctors give me full confidence in their ability to care for Kiira and catch things early so we can treat them before things go wrong. 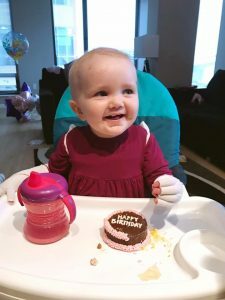 Kiira doesn’t even act like she went through another BMT–she is full of energy and soaking up things like letter recognition and sounds, numbers, animals, and so much more. She is now 2 and I know the days of “I do it” are coming, but for now I’m thankful she lets me help her when she needs it, even telling me to pop her blisters or cuddle her when she gets hurt. She inspires me every day! Happy 2nd birthday to our sweet Kiira! She has overcome so much in the past 2 years and we have faith that God will continue to be with her every step of the way. Day +66: I want to say a special thank you to my aunt and uncle who spent the last two weeks with us. Kiira had so much fun and it was a huge help to me as well. We dropped them at the airport today and Kiira cried. We are sad to see my aunt and uncle leave, but so excited that tomorrow we will return to the airport to pick up Kiira’s daddy and sisters. It’s been over 2 months since they left and they will be visiting for a few days to help us celebrate her 2nd birthday on the 12th! I forgot to mention that the last two CMV tests, the virus that Kiira was fighting, have been negative! We still have 4-5 weeks of IV meds to finish up, but we are so happy the virus went away with no effect on Kiira. Please pray for safe travels for my family and prayers of thanksgiving for all that God has already done for us.